I have come across girls with beautiful sharp facial features but having dark spots on face especially on the portion around the lips and chin. It saddens me because despite her having a good face, her skin makes her look dull and lifeless. Such facial skin problems are often reported to drive young females into severe depression where they suffer from low confidence and low self-esteem. But there is no need to worry because dark spots can be removed naturally using simple remedies. I once had a talk with one of my beautician friends regarding this and I got to know about some common kitchen ingredients that helps remove dark spots easily. With further research, I found out about some easy solutions that actually work, and thought of sharing those tips and remedies with you. In my today’s post, I will give you 19 essential tips and remedies to remove dark spots around lips and chin easily. So if you are tired of dark spots around lip and chin and seriously looking for a natural solution, then continue reading this post. The pollution, improper food habits, unhealthy lifestyle etc has lead to several skin problems. To top it up, the hectic routine life barely allows us to take care of ourselves. Therefore, we face various skin problems with dark spots around lips and chin, being one of the most common skin issues. In such situations, we generally either run to skin doctors or start using the commercial market products that promises overnight results. 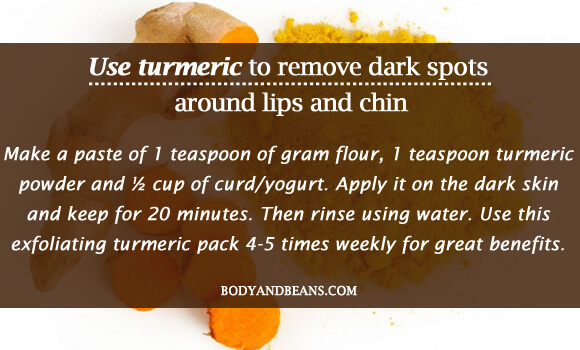 But, amidst all these we forget about the natural home remedies to remove dark spots around lips and chin easily. So today, I want to talk on this topic and I’ll share some of the easiest, cheapest and most effective tips and remedies to remove the skin discoloration on your face. But before we start discussing those tips and remedies to remove dark spots around lips and chin, I want you to know about the factors that lead to such skin problems. Knowing the cause will certainly help you get to the root and get rid of these skin issues easily. Every disease has its own set of factors that lead to its occurrence. Similarly, some common factors lead to the occurrence of dark spots around lips and chin. While some factors may not be in our control, others mostly start with us, to be more specific with our unhealthy lifestyle. Thus, it is important to know the common factors leading to dark spots, in order to reduce the risk of its occurrence. Now that you know the causes, let me start with the essential tips and home remedies to remove dark spots around lips and chin easily. Going natural is always a better option and to get rid of the dark spots around your lips and chin, you can easily take the help of the natural ingredients like lemon, cucumber, potato, aloe vera gel, tomato etc to name a few. These remedies are easy to apply and the ingredients involved are safe, cost effective and easily available. So, here are few of my favorite home remedies to remove dark spots around lips and chin easily. We all know that lemon is a natural bleach and has been in use since a long time to lighten the skin tone. This is mainly due to the presence of citrus acid that acts on your darkened skin and helps you to fade the dark spots. However, since many find lemon a bit dry, you can easily mix a bit of rosewater or olive oil with it to dilute the effects. Both olive oil and rosewater is good for skin nourishment and moisturizing and so you can use any one of it. Take a lemon, squeeze out the juice from it and then add adequate rosewater in it. Dip a cotton ball into the mixture and apply the solution in the dark spots around your lips and chin. Keep it for 10 minutes and then wash off using tepid water. You may use this remedy 4-5 times weekly to get the good effects. 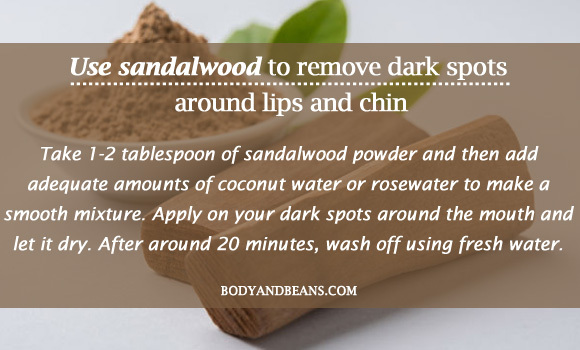 Sandalwood is an age-old remedy as far as skin care is concerned and you can definitely use it to remove dark spots around lips and chin easily. Sandalwood has a soothing effect on your skin and suits all skin types. It has great ability in lightening the skin tone all thanks to its anti-inflammatory and astringent properties. You can easily use it with coconut water or rosewater to get added benefits. Take 1-2 tablespoon of sandalwood powder and then add adequate amounts of coconut water or rosewater to make a smooth mixture. 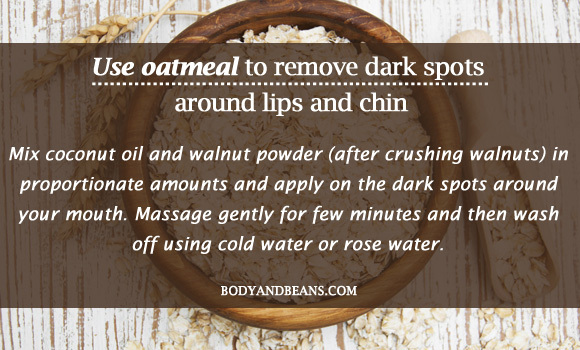 Apply on your dark spots around the mouth and let it dry. After around 20 minutes, wash off using fresh water. Use this remedy each alternate day for quick results. 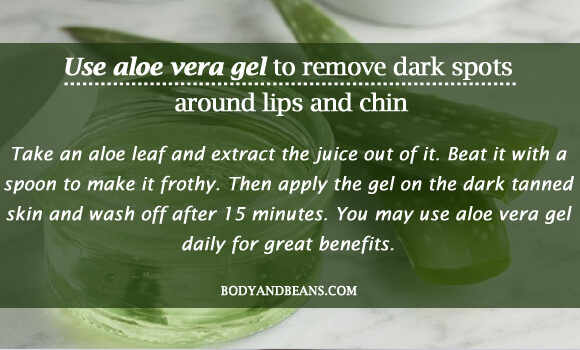 The harsh ultraviolet rays of the sun is one of the significant causes behind the occurrence of dark spots around lips and chin and if this is your case, then you can jolly well use the aloe vera gel to get rid of it. The aloe vera gel will soothe your skin and give a cooling sensation. It will also moisturize your skin and help you to lighten the dark spots around your mouth. Take an aloe leaf and extract the juice out of it. Beat it with a spoon to make it frothy. Then apply the gel on the dark tanned skin and wash off after 15 minutes. You may use aloe vera gel daily for great benefits. 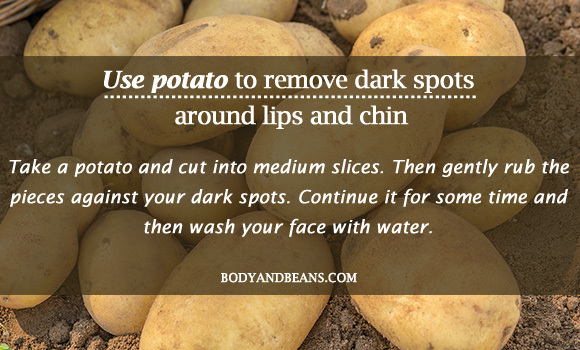 Using potato is definitely one of the best home remedies to remove dark spots around lips and chin easily. This natural bleach has cleansing properties and can clear off the dead skin cells and the impurities that may have caused your skin darkening. So besides using it for culinary purposes, try it out to remove your dark skin patches today. There can be two methods of using potato. Firstly, you may take a potato and cut into medium slices. Then gently rub the pieces against your dark spots. Continue it for some time and then wash your face with water. Alternatively, you may grate the potato and squeeze the juice out of it. Then apply it on your dark skin using cotton pad. After 10 minutes, you can wash it off. Both the remedies are effective and can be used daily for greater benefits. Yogurt is very efficient in dealing with skin problems and can surely help you in getting rid of the dark spots around lips and chin. Yogurt is rich with various enzymes that remove the tan or the dark color and imparts a milky white glow on your face. If you mix this yogurt with the moisturizing honey, the pack definitely becomes one of the best home remedies to remove dark spots around lips and chin easily. This pack will not just remove the spots but also make your skin soft and supple. 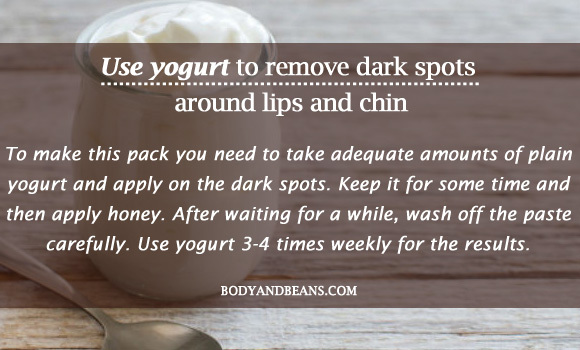 To make this pack you need to take adequate amounts of plain yogurt and apply on the dark spots. Keep it for some time and then apply honey. After waiting for a while, wash off the paste carefully. Use yogurt 3-4 times weekly for the results. This easily available ingredient is highly used in beauty remedies and using it, you can also get rid of the dark spots around lips and chin. Gram flour is a skin friendly product that helps to lighten the dark skin tone. The coarse particles also help to clear off the dirt and other impurities, which leaves the skin healthy and glowing. There are various ways of using gram flour and I will discuss two of the methods that I prefer. One using milk and rosewater and the other with almond oil. In the first one, you have to take around 2 tablespoon gram flour with 1 tablespoon of both milk and rosewater. Then apply the solution on the affected skin and moisten it with water after 20 minutes. After that, scrub the mask first in clockwise direction and then anti-clockwise. In the other method, you need to make a mixture using adequate gram flour and almond and then apply the paste. Wait for 15 minutes and then wash using water. 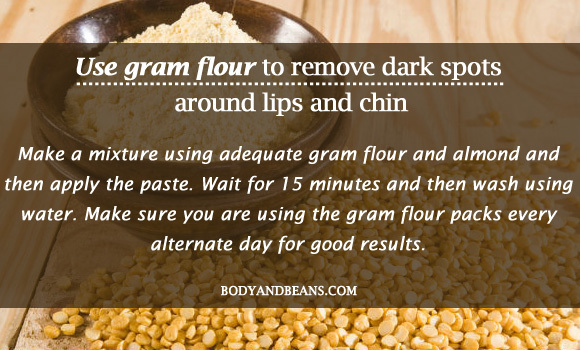 Make sure you are using the gram flour packs every alternate day for good results. Turmeric has various healing properties and is a great product to get rid of skin problem as well. It is mainly the curcumin content in turmeric, which can deal with several skin problems with the darkening of the skin around lips and chin being an essential one. It reduces the dark skin tone and leaves a healthy glow on your face. You will also be able to remove the dead skin cells and other impurities that may have cause the skin discoloration. In order to manifold the good effects of turmeric, you may use a bit of curd and gram flour to it. To prepare the paste, you need 1 teaspoon of gram flour, 1-teaspoon turmeric powder and ½ cup of curd/yogurt. Apply it on the dark skin and keep for 20 minutes. Then rinse using water. Use this exfoliating turmeric pack 4-5 times weekly for great benefits. The list of home remedies to remove dark spots around lips and chin will be incomplete without the mention of the skin friendly cucumber. Well yes, as per studies the phytochemical and the therapeutic potential of cucumber is undeniable and it can nourish your skin, cleanse it off the impurities and toxins as well as soothe the various skin irritations. Applying cucumber on your dark spots will work great in removing the dark spots and if you add little honey, it will be of great help to you. 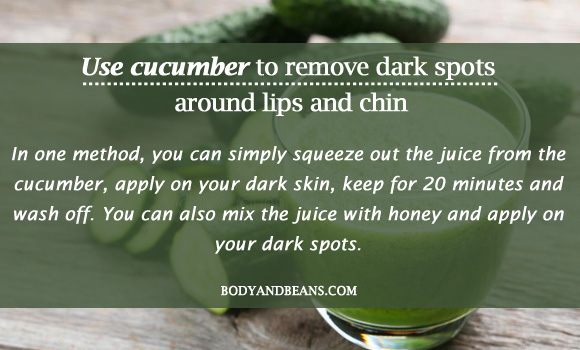 In one method, you can simply squeeze out the juice from the cucumber, apply on your dark skin, keep for 20 minutes and wash off. You can also mix the juice with honey and apply on your dark spots. Cucumber generally suits all skin types, so you may use it on regular basis. 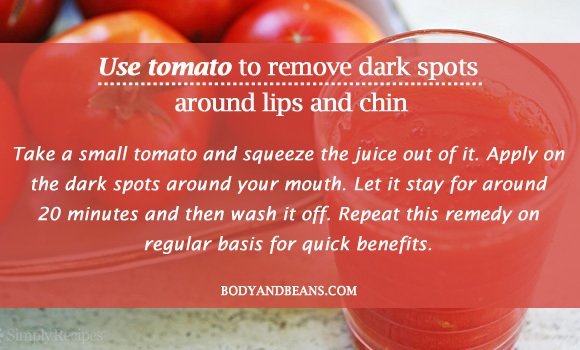 Another culinary ingredient that you can use to remove dark spots around lips and chin is the tomato. Tomato is great for pigmentation and is well known for its anti-puffiness. It is a natural bleach that can have instant effect on your dark skin. With tomato application, your skin tone will lighten and you will have a glow on it. Take a small tomato and squeeze the juice out of it. 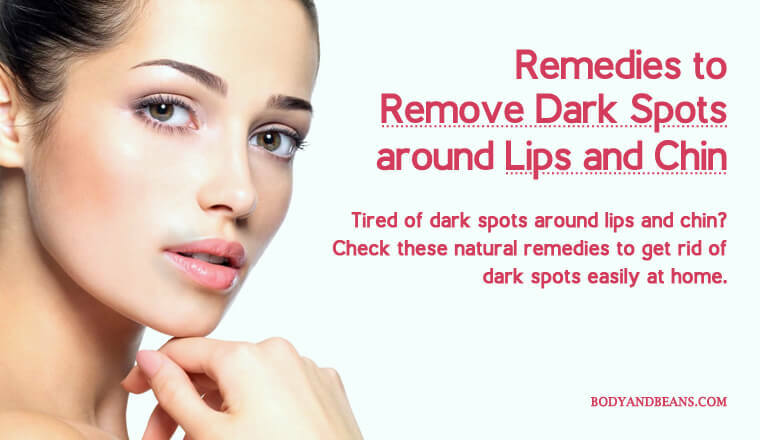 Apply on the dark spots around your mouth. Let it stay for around 20 minutes and then wash it off. Repeat this remedy on regular basis for quick benefits. Long gone are the days when people used coconut oil only for hair as now coconut oil has shown to give great skin benefits. Reports has already shown its efficiency against dermatitis and now you can use it to remove dark spots around lips and chin as well. You can easily make an exfoliating pack using coconut oil and walnut powder to get soft, supple, and glowing skin. 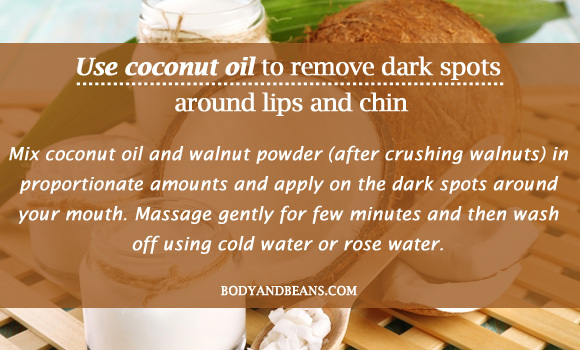 To get the benefits, you need to mix coconut oil and walnut powder (after crushing walnuts) in proportionate amounts and apply on the dark spots around your mouth. Massage gently for few minutes and then wash off using cold water or rose water. You can use this remedy on alternate days for the significant improvements. Besides simply eating oatmeal to keep yourself healthy, you can try it out to get some skin benefits as well. Oatmeal has cleansing properties that washes off the harmful chemicals, toxins and impurities from your skin and lets it breathe. Research shows oatmeal as an anti-inflammatory agent that can even provide you protection from the harmful ultraviolet rays. You can either mix oatmeal with buttermilk or alternatively use it with yogurt and tomato to get rid of the dark skin patches. The methods are mentioned below. Take around 2 tablespoon of oatmeal and mix it with 3 tablespoon of buttermilk. Apply on your dark skin and massage gently in circular motions. Continue for few minutes and then rinse using water. Alternatively, mix oatmeal, yogurt and tomato juice, 1 teaspoon all and then apply that on the dark skin. Scrub for 5 minutes and then rinse after 15 minutes. You can use any of the remedies two times in week for significant improvements. However, if you have allergy for dairy products, you may simply mix oatmeal with plain water and use it to get the benefits. 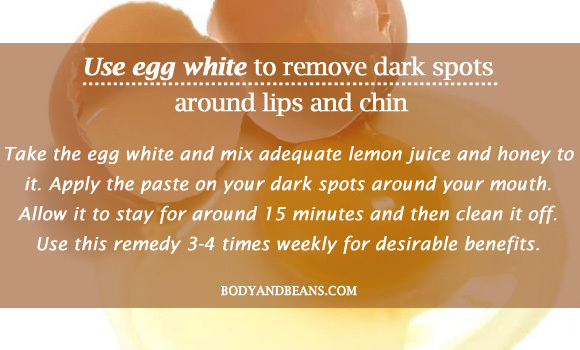 Egg white mask is one easy way to get rid of the dark spots around your lips and chin and you must definitely give it a try. Egg white lightens your skin tone and clears it off the impurities leaving behind a healthy glow. Nevertheless, sometimes, people complain that it dries your skin, so you can easily use the moisturizing honey to lessen the drying effect. 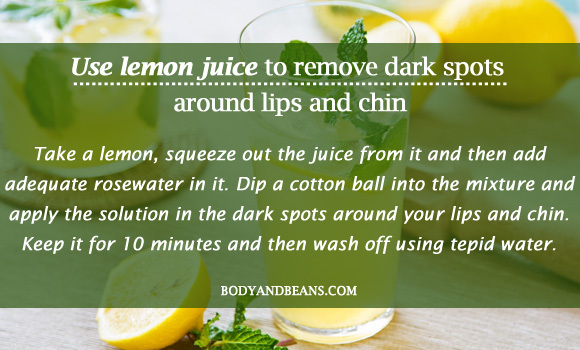 Adding lemon juice completes the paste and becomes one of the best home remedies to remove dark spots around lips and chin. Break an egg and separate the egg white from the yolk. Now take the egg white and mix adequate lemon juice and honey to it. Apply the paste on your dark spots around your mouth. Allow it to stay for around 15 minutes and then clean it off. Use this remedy 3-4 times weekly for desirable benefits. Now that you have known about the remedies, let me tell you some other tips following which you can avoid the occurrence of the dark spots around lips and chin. The home remedies mentioned above will help you to get rid of the dark patches but since few of the causal factors starts with you, it is advisable for you to make certain lifestyle changes in order to avoid its occurrence. Quit smoking– If you want to stay healthy and happy, then you have to quit smoking. It is not just to avoid the occurrence of dark spots around lips and chin but also for your general wellbeing. Protection from sun– You have to protect yourself from the harmful ultraviolet rays. Whether you go out, never forget to carry an umbrella. If you feel uncomfortable to carry umbrella, then cover your face with a handkerchief or a scarf. Moreover, you must use a sunscreen to get protection from the UV rays. Do not let your skin get dry– Excessive dry skin is one of the factors behind the occurrence of dark spots. So make sure your skin is properly nourished all the time. In winter, since the weather is dry, make sure you use a good moisturizer. Stay hydrated– Drinking lots of water is mandatory. It keeps you hydrated and also flushes out the chemicals, toxins and impurities from your system. You need to be clean from within in order to look flawless from outside. Stop using harsh makeup– Most of the commercial products contain chemicals and so the more you use them, the more harm you cause to your skin. So please use the natural home ingredients to take care of your skin and avoid doing harsh makeup. Avoid frequent waxing/bleaching– You already know that repeated and frequent waxing or bleaching can cause dark patches on your skin so why trouble yourself using costly mechanisms but with adverse consequences. Avoid all these and find natural ways or other alternative procedures that are less harmful. 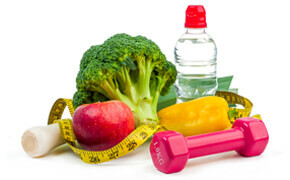 Take medical help– For most of you the natural home remedies will work and will gradually show improvements. However, if in your case, it does not improve even after several usages, then yours might be due to a side effect of certain disease. In such a situation, never hesitate to show a doctor and take medical help. Over to you: which is your fav remedy to remove dark spots? The dark patches around the mouth are definitely unimpressive to look at but with the natural home remedies, you can easily get rid of them. If you go search your kitchen, you will find many ingredients that are efficient to lighten the dark spots. The common kitchen products like lemon, honey, tomato, potato, yogurt, egg, etc that you need almost every day for culinary purposes, if used properly can work wonders on your dark skin. I have mentioned all the essential tips and home remedies to remove dark spot around lips and chin easily but you must never expect overnight results. These natural ingredients are very effective but they take some time to work on your skin. So you need to wait patiently and diligently use the methods to get the results. However, in case the remedies do not work on you, please do consult a doctor. Do you have dark spots around lips and chin? Have you checked 19 of my essential tips and home remedies to remove dark spots around lips and chin? Do share the feedback and feel free to suggest other essential tips and home remedies to remove the dark spots from lips and chin. Also, like and share the post with others. Until then, stay beautiful and do not let the dark spots ruin your day. Home remedies are the best solution for skin diseases and we can access them easily. These remedies work wonderfully to remove dark spots. I recently removed my dark spot by using aloe vera gel. It was effective and painless and my dark spot were vanished. Thanks for informative blog.